Some of the levels in the game had very familiar feelings to them. When you have a company as large and as diverse as Nintendo, there are a plethora of video game heroes at their disposal to do things with to print money. Sure you’ve got the epic Mario, Zelda & Metroid games, but what do you do to fill the gap between these modern day masterpieces with your characters? You put them in a scrap, that’s what. 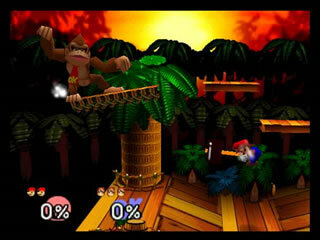 Super Smash Brothers was a intreaguing concept when it was first announced. Mario, Link, Samus, Luigi & Pikachu (amongst others) would be beating seven shades of stars out of one another in a number of worlds themed on Nintendo games. It was odd for a couple of reasons – the first was because it was odd seeing the usually serene and happy & bouncy Nintendo inhabitants beating each other up. The second was how would it work, and the third would be why? To answer the first question – the violence. Well, it’s very slapstick at best. Each of the characters has a punch/kick move, and a number of special moves which are based on the character’s abilities (eg. Mario shoots fireballs, Yoshi throws eggs etc. ), it’s no worse violence than is in the actual games themselves, and plus when people are “knocked out”, they are thrown from the screen, rather than to the floor. This, along with the fact that the special moves are all ridiculously easy to pull off, meaning that it’s suitable for kids, and people who have a social life. And so brings us onto our second point. How? 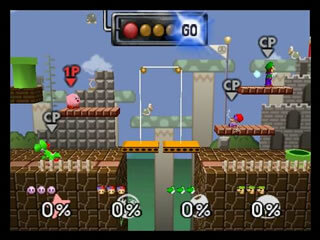 Well, the 12 or so characters fight on one of 10 stages, and each of the moves takes is awarded a perecentage score. You start with 0% and it can be upto 300%. At 300% even a slight move can knock you from the screen. Upto 4 players can play at once and it can be pretty hectic and at times difficult seeing what is going on. Nevertheless, the control system isn’t a barrier for entry, and it’s a good game for a night in. Yes, this game is great fun, but very little replayability in single player mode, after you’ve unlocked everything. Where this game shines is in two places. The first is in multiplayer. Get 3 or your mates, a crate of beer, and a big screen TV, and this game is an ideal weekend in. It’s a great leveller that even the most skilled players won’t win all the time, and ranks alongside games such as Super Bomberman in that respect. It is also great for those of you who have a deep interest in Nintendo history. The stages, music, graphics & items are all Nintendo game based, which is a nice touch, and a great trip down memory lane. This culminates in a great – if hardly deep – fighting game featuring 12 of Nintendo’s finest characters. Why they are fighting though? I haven’t the foggiest.